How did I take this photograph? Very carefully. This Japanese honey locust is located near a rubbish bin, an attractant to the local population of yellow-jacket wasps. Since the bin is sealed, the wasps instead congregate on this tree – one landed on these pods a few seconds after taking this shot. Oddly, most of these 20cm (8in) long pods had been (or were being) chewed down by the wasps, particularly those pods in less exposed areas. This is one of those plants for which the scientific name is being settled upon. Originally received by UBC Botanical Garden as (and posted to BPotD as) the variety koraiensis, this was thought to be a Korean morphological variety of the species identified as distinct from the rest of the species by Nakai (though it also grows in China and Japan). Authoritative taxonomic databases did not reflect Nakai’s interpretation, instead placing it strictly as the species Gleditsia japonica. We updated the name of this plant in our collections to match the authoritative databases in 2007. In addition, our two molecular data sets show different relationships among the G. japonica accessions. The cpDNA data suggest that the South Korean and Japanese accessions cluster separately from the Chinese accessions. In contrast, all the analyses of ITS data alone and the ML analysis of combined data place the South Korean accessions in one clade and the Japanese and Chinese accessions in a second clade. More extensive sampling of G. japonica, especially in China, will be necessary to determine whether any of the subspecific designations of G. japonica are phylogenetically justified and to clarify the taxonomic complexity of this group. It needs to be noted that clarifying the taxonomic complexity at this resolution was not the main goal of their work, as they were looking at Gleditsia more broadly. The researchers did suggest that more data was needed; this is achievable, as the species is in no way threatened. Nature resource link: I linked to it five months ago, but it’s worth mentioning again since there are so many new readers of BPotD–“Beauty and the Botanist“, an essay by the late Dr. Stan Rowe. If you’ve ever wondered about BPotD’s tagline, “In science, beauty. In beauty, science. Daily”, this is the essay that serves as the inspiration. I have been wanting to ask for some time and today’s entry gives me an opening: Could you please give us some links to the whole taxonomy issue? My interest was initially generated by reading Daniel J. Hinkley’s frequent references to the issue. How and why is it that so many plants are in limbo as to their correct/finalized/accepted names? Which periodicals &/or databases contain this information? Which are the ‘authoritative taxonomic databases’ you mention? How is DNA changing the situation from the historical practice of naming and changing names of plants? What is the rationale behind the 2 basic philosophies of ‘spliting or lumping’? And anything else a lay person who loves plants and is eager to learn more would like to know about this issue. How important is it to the world of botany? Victoria – wow, all great questions. I’m going to need a bit of time to think about how and in what way to address them, as they shouldn’t be buried (over the long term) in the comments section of one entry. Stan Rowe cuts through our increasingly ecodestructive technologies to champion the intrinsic beauty of our living, real, world. How can we put crass economic value on such a sublime personal experience? We can try of course but sadly it generally creates a ragged artifact of dubious validity. Many thanks Daniel. Loved the Korean honey locust image, which brought back rich plant-hunting memories of this plant in the wilds of South Korea in 1985. I had the good fortune to participate in the 1985 Plant Exploration Program on the Southwest Coast and Islands led by Barry Yinger of the U.S. National Arboretum, Washington D.C., with the dynamic duo of J.C.Raulston and Dr. Ted Dudley, both of which have sadly passed away. We saw and quickly identified this species as we travelled through coastal areas of this region. It’s signature included a hunched crown profile, crooked spinose trunk and highly irregular branching. The specimen shown here is derived from seed collected under KE# 3741, NA 56671, collected in Cholla Pukto, Puan Gun, Sangso Myon, Chongnim-ri, Soun Village, 10.9.85. This tree is a tough customer dealing well with poor sandy or rocky soils and considerable seaside exposure, including salt-spray. The crouching habit is admirably suited to the frequent typhoons that frequently lash this coast. We also saw an upright form that was used as a street tree in several coastal towns. This we took to be a Japanese derived clone – vastly different from the rural populations we examined. 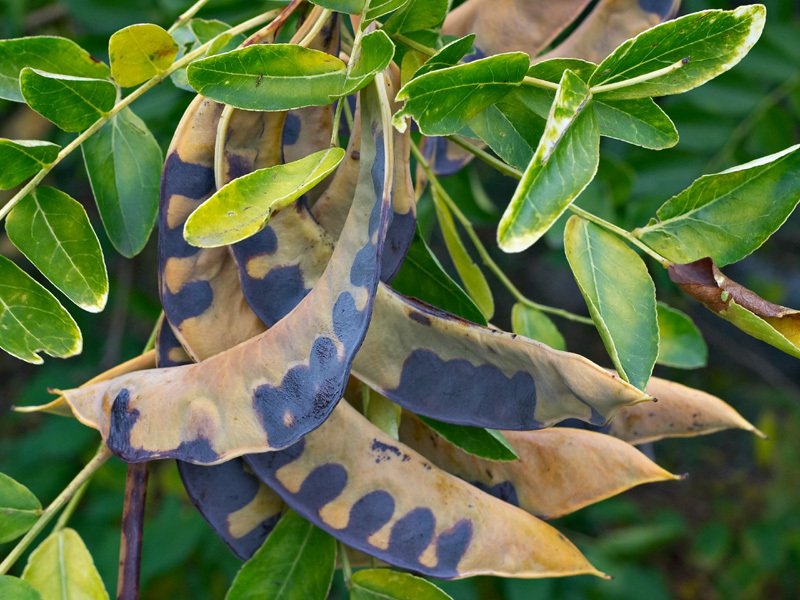 Quoting from our field notes, the fruits were described thus – ‘twisted yellow or yellow-green legumes turning brown’. I noted at the end of my notes on this collection that seeds were sent to Hergest Croft in the U.K. – it would be interesting to to know if it is flourishing there.